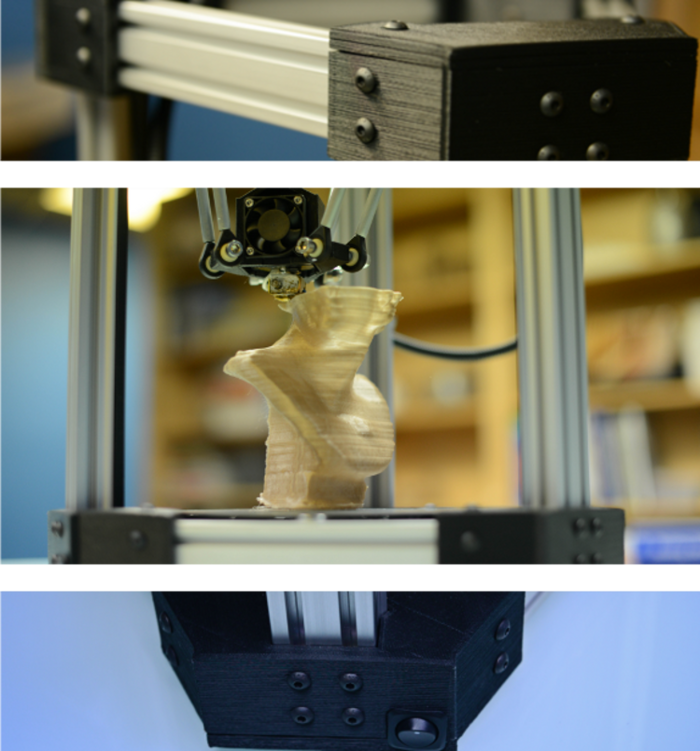 Another day, another 3D printer on Kickstarter. But the DeltaMaker, which launched its campaign this week, is a little different from some of the others we’ve seen to date. It’s not the cheapest, and it’s not the one with the most recognizable branding, but it is relatively affordable and has a slightly different mission than most, with a design intended to shine in public spaces, rather than hidden in an industrial workshop. DeltaMaker’s founders believe that the process of digital printing is at least as interesting and valuable as the products it creates, and their backgrounds reflect their interest in the actual engineering that goes into printing a 3D product and the hardware required to make that happen. The Orlando-based company consists of Zach Monninger, a mechanical engineer and MBA; Craig Rettew, an electrical engineer; Robin Lopez, an aerospace engineer; and Bob Houston, a software engineer. If ever there was a group of people who were all about the process, this is it. DeltaMaker gets its name from the fact that it’s a so-called “delta robot,” which is a three-armed design used in industrial and manufacturing applications of all stripes, since it can precisely position the business end (or extrusion head, if you want to be technical) along X, Y, and Z axes. The delta robot design is not only functionally effective, it also makes for a visually interesting printing process, one that DeltaMaker suggests will play well in your tastefully decorated sitting room, in classrooms and in waiting rooms and gallery spaces everywhere. The idea is not just to educate, but also to entertain; the founders envision a 3D printing process captivating the attention of a group of kids waiting to see the dentist, or keeping guests entertained at a dinner party if your table conversation gets dry. Accordingly the DeltaMaker is relatively simple in its design, keeping things basic with a tall aluminum structure that’s only 9-inches in diameter, and a 360-degree viewing angle of the building chamber itself. That design likely won’t change too much from current prototype to shipping product – it’s already on its 4th revision and the team says they’re in the final stages of detail engineering. 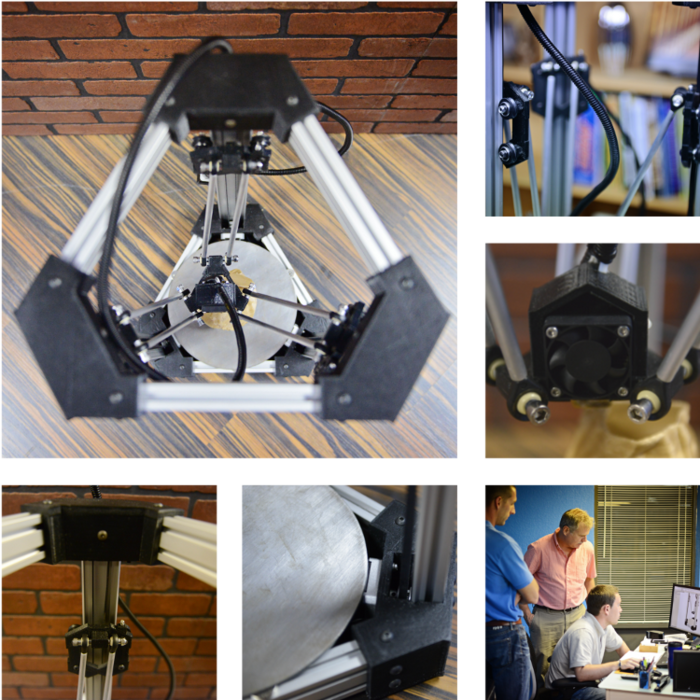 As for pricing, the early bird pledge level of $499 for a fully assembled, working unit sold out incredibly quick. Now, you can get in at a minimum of $1,099, but those are also special tiers. Even if you come very late to the game, pricing for Kickstarter backers tops out at $1,599 for a fully assembled unit, which is still not too expensive for the 3D printer category.